UPDATE The Utne Reader has written a lovely little post about the new poster. Read it here. 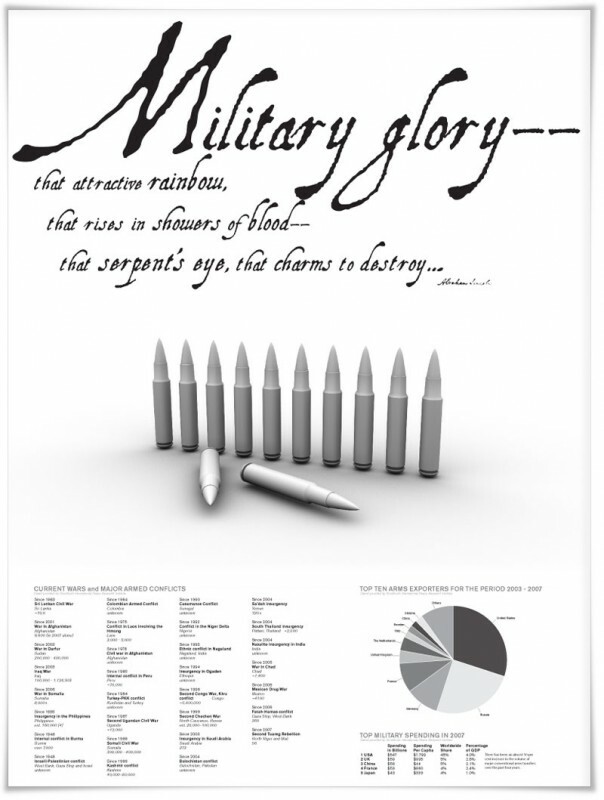 The new poster for Poster Offensive has been printed and delivered. 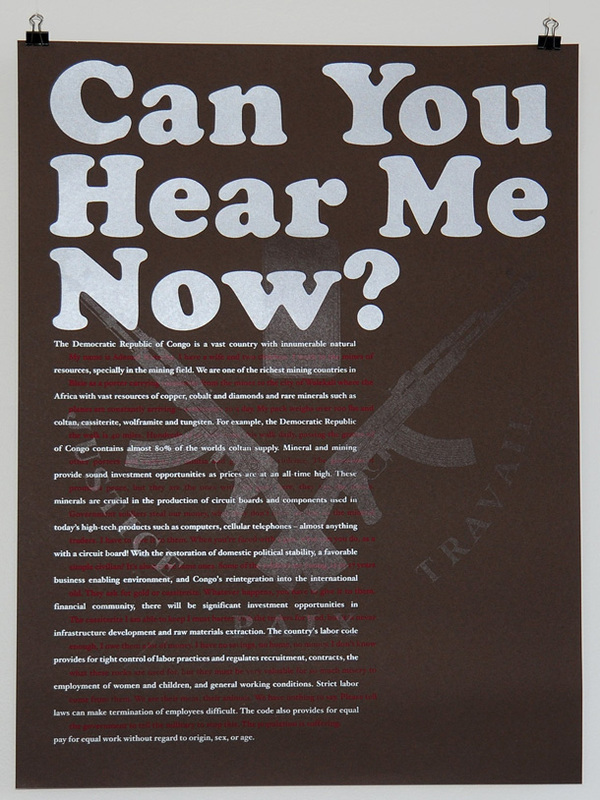 Poster Offensive is an independent, non-partisan poster show, which utilizes the politically potent medium of the poster to showcase contemporary interpretations and critiques of political and social issues. There have been four Poster Offensives, the last of which coincided with the 2008 Republican National Convention in St. Paul, Minnesota. 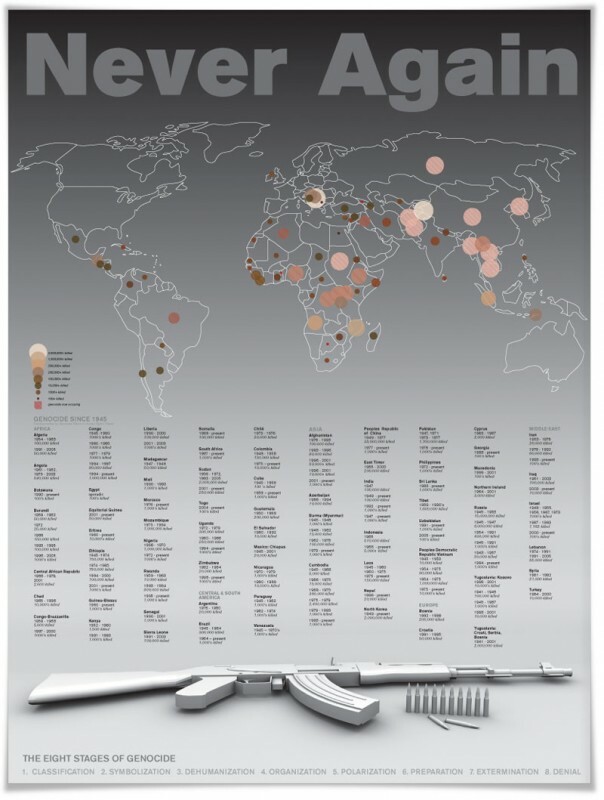 For previous Poster Offensive shows, I’ve examined datasets involving genocide, for this one I decided to examine the state of conflict minerals in Africa and our dependence on them for high-tech gadgets, computers and other detritus of daily life. Cassiterite, which is the mineral I write about in this poster, is actually being touted as a green solution to tin and other more harmful minerals. I was having trouble envisioning data for this piece, so instead looked at interweaving two narratives which is a technique I’ve used in a couple pieces – most recently Neighbors. The narratives here show two perspectives of artisinal mining through the eyes of a pro-mining marketing piece, and those of a mine porter. The poster was screen printed using silver and dark red representing the mineral and the blood shed in the pursuit of said mineral. 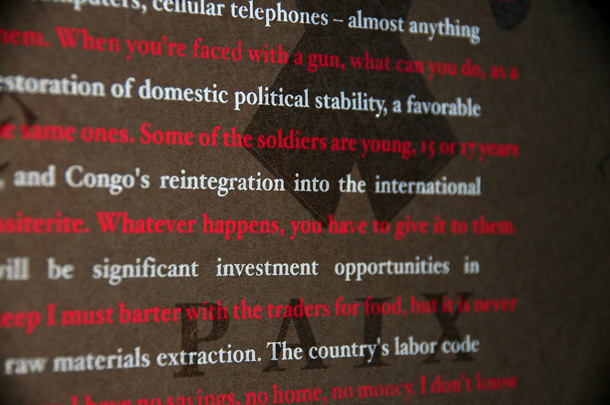 The poster is then printed with a varnish coat overlaying a re-interpretation of the Congolese coat-of-arms. The poster is printed on a heavy cover stock from French papers. Much love out to Lucas Richards for the printing. Here’s a nice shot of the poster plus a detail shot. Most of these are for sale at the Complete website. Here are some of the posters done for past shows. This years Poster Offensive looks to be a spectacular one. I just finished up my poster for the show.I’m pretty excited about it. Here’s a rough phone snapshot. 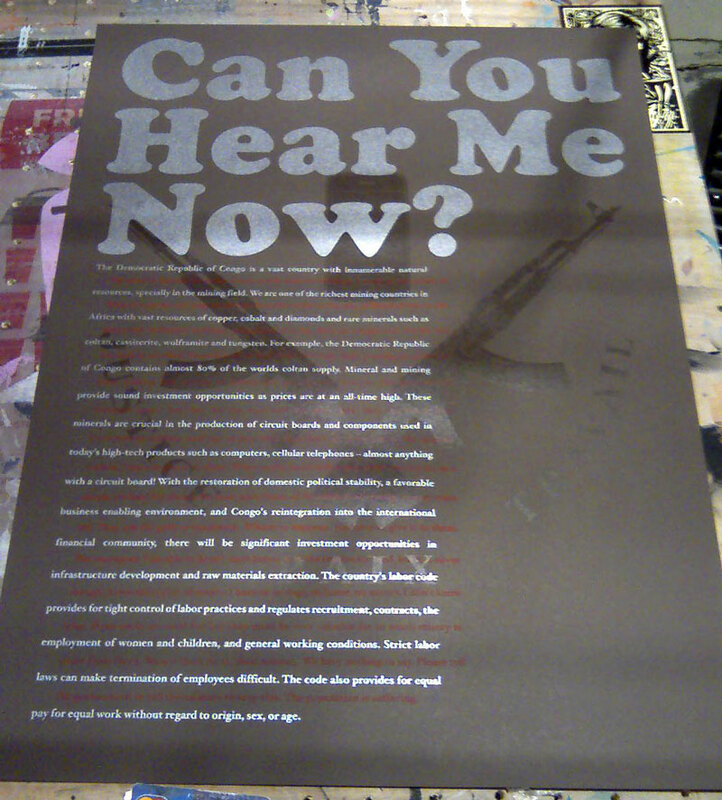 Title: Can You Hear Me Know? With the ever increasing preponderance of high-tech gadgets, our reliance on scare minerals has become more apparent. Many of these minerals, cassiterite, coltan and tungsten, are found in regions of the world torn apart by violence. Much of the mining is done by those caught in the middle of these conflicts, and often at gun point. In our truly global economy, mining endeavors are not carried out by one government or corporation, but by multi-national conglomerates. This poster looks at the two sides of the situation in war-torn Congo, an epicenter for conflict minerals, at a government hungry for foreign investment in order to rebuild its lagging infrastructure, and a simple miner struggling to survive. I’m launching the new PatrickMaun.com. I’m still working on a few things, but wanted to get it up since I haven’t really touched the site since 2006. I’ll be adding the videos and more images for the various projects as well as a few other features. So keep watching. I've stared a blog to highlight projects I'm working on and research I'm undertaking. I'm not sure how much I'll actually update, but I'll attempt to keep the content fresh.